Bright, modern and fully equipped houses and apartments available all year round. We want you to feel at home while you're with us. Choosing where you live and what kind of accommodation you want is a key decision in your time here at GCI. Living in a residence offers you more independence than if you decide to choose host family accommodation. The residences that we have on offer are chosen for their proximity to the school as well as the quality of accommodation and living spaces. We choose bright, modern and comfortable living accommodation. You will be sharing with other international students from Galway Cultural Institute. Students who live in one of our residences make lifelong friends with the housemates that they live with. We encourage you to share your cultural customs with your housemates and learn from theirs! Teach them about your cuisine, your country and how you do things back home. It works out best if you share meals with other house mates as often as possible - it shares the work of preparation, cooking and cleaning! Eating together is both more affordable and more enjoyable. If you have never cooked before, NOW is the time to start and you can prepare delicious and simple meals easily. You will be sharing a residence with other people. Play games together, organise activities at the weekend and help each other with homework. If the other people you are living with do things differently from you, please be patient with them, be prepared for a new experience! This is your home away from home and you are sharing with other students who will become your 'Galway family'. Be respectful and please do not create an open house for your friends. This interferes with other members of the household and it is neither fair nor acceptable. Please be aware that you are responsible for the behaviour of your guests and you will be liable for any disruption caused by them. All visitors are required to leave residences by 22.00. Our residential apartments are divided in 3 star and 4 star. The difference between the two type of residences lies in the finishing standards of the accommodation. We constantly improve and upgrade our residences throughout the year, but basically the 3 star residences are older apartments that have a smaller living space and not such a modern design compared to newer built buildings. 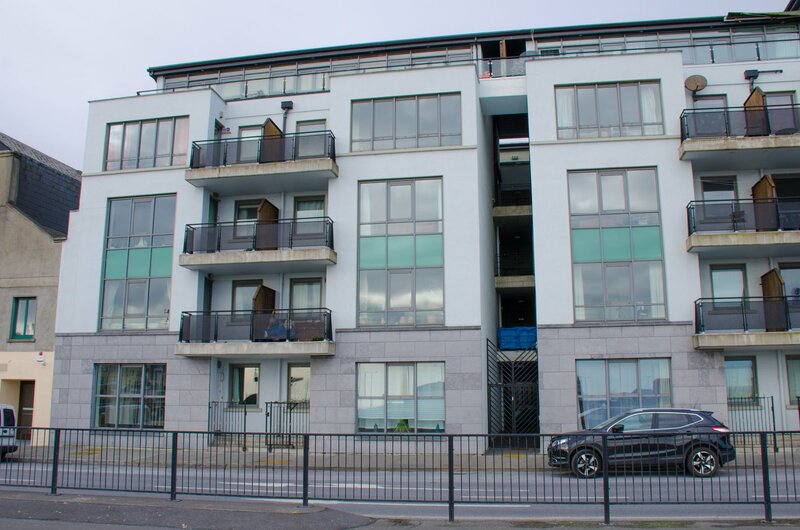 However, both types of residences are ideal options for students that want to enjoy an independent living while studying their English courses in Galway. Remember not to speak anything other than English! We try and make it so that our students are matched with people who don't speak the same language as them, but cannot guarantee that this will always be the case. Please take sensible precautions with regard to your personal belongings and security. Lock bedroom doors and all exit doors keeping windows closed when you are not in the residence. Please remember that you are sharing the residence and you are required to keep your room and all common areas clean and tidy. All students are responsible and must clean up after themselves. Please ensure that the bathroom is left clean and dry after use and that if the bathroom is shared with other students you need to be considerate. Make sure that any food you buy is stored in the correct part of the fridge. Please throw away any food which is no longer fresh. Do not overfill the fridges and do not leave open tins in them. Empty your shelf on your departure. Students are provided with clear rules and regulations regarding the accommodation designed to make your stay and those of your housemates happy and successful. GCI/GBS require a refundable deposit of €150 for each individual student who is in residential accommodation. This can be paid before arrival or on the first Monday either by credit card or by bank transfer (no cash accepted). Residences are available from Saturday to Saturday ONLY. Check in time is 17.00 and check out time is 10.00. Extra nights are not possible in residence and we organise an alternative, if it is needed. Charges will apply. Please inform GCI/GBS staff of any breakages or problems with the accommodation so that we can fix them immediately. Rubbish must be recycled in accordance with Galway Corporation directives. All bicycles should be placed at the side of the house, not inside the house. Students are allocated one set of bed linen - 1 pillow slip, 1 sheet and 1 duvet cover. Towels are not provided. Smoking, use of illegal substances, pets etc.are explicitly prohibited. The school does not permit drinking in the estate grounds of the complex or in the garden. There should not be loud music late at night and please show respect for your neighbours. There is a no noise policy between 23.00 pm and 07.00 in the morning. Please note that GCI/GBS staff checks all residences weekly, on departure and at various intervals throughout the week. Failure to abide by the Rules and Regulations will mean you will lose your deposit or part thereof and you will be liable to vacate the residence.